When Congress passed the Energy Independence and Security Act of 2007 (EISA), the incandescent bulb's days officially became numbered. The law mandated strict new energy standards for lighting designed to kick-start a new era of greener, longer-lasting, more cost-efficient light bulbs -- and this meant kicking outdated, inefficient bulbs to the curb. The rising standards have already rendered 100W and 75W incandescents obsolete, and on January 1, 2014, their 60W and 40W cousins met the same fate. Congressional budget waffling seemed to put the new standards on hold, but it was largely too late -- the industry had already moved on, and wasn't interested in reversing course. Like it or not, the arrival of this new era means that replacing your lights will never be quite the same. With all of the new options out there (not to mention the disappearance of some important old ones), finding the perfect bulb can seem pretty daunting. New lights that promise to last 20 years and save you hundreds of dollars might sound good in theory, but how do you know which one is the right one for you? How do you know the bulb you're buying is going to be bright enough? And what if you're just not ready to say goodbye to your incandescents? Well, fear not, because we've got you covered with a handy guide that's chock-full of all the information you'll need to make sure that your next light bulb is the right bulb. What kinds of bulbs are available? 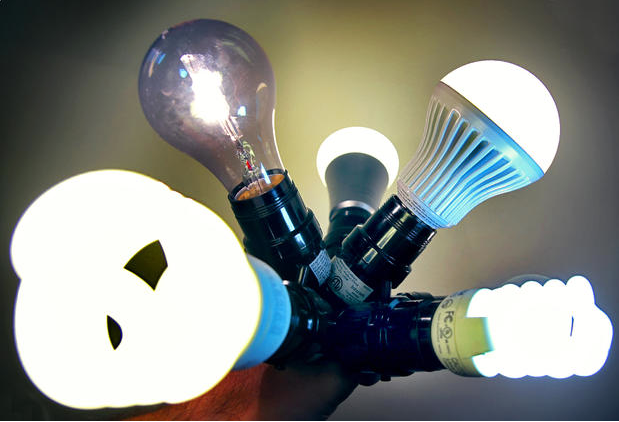 We've all gotten to know incandescents quite well over the past 135 years or so, but times are changing and there are several new types of lights to consider, like light-emitting diodes (LEDs), compact fluorescent bulbs (CFLs), energy efficient incandescents, halogens, and smart bulbs. Light-emitting diodes, or LEDs, are the new rock stars of the bulb world. A typical LED uses a fraction of the wattage required to power a bright incandescent bulb, and this makes LEDs dramatically more cost-effective over the long run. A 12W LED that puts out 800 lumens of light (lumens are units of brightness for a light source -- more on that in just a bit) will add about a buck and a half per year to your power bill if used for 3 hours a day at an energy rate of 11 cents per kilowatt hour (kWh). Under those same parameters, a 60W incandescent bulb that puts out 880 lumens will cost about $7.50 per year. Multiply that by the total number of bulbs in your home, and you're potentially looking at some pretty significant long-term savings. LEDs are also rated to last for tens of thousands of hours, which can translate to decades of use. Compare that with the year or so you typically get out of an incandescent, and you can begin to see why so many people find these bulbs appealing. At a price of about $15, that 12W LED would pay for itself in 2.5 years, then keep on saving you money for years to come. Yes, really -- at least, according to Energy Star and the Illuminating Engineering Society (IES), the independent organization that created the testing procedures manufacturers use to rate LED lights. LED lights don't "burn out," the way that incandescents do. Instead, they gradually growing dimmer and dimmer over time. If an LED says it'll last 25,000 hours, it's really saying that it will take the bulb 25,000 hours to fade down to 70 percent brightness. And, as with any device relying on tiny, delicate electrical components, things can go wrong. Some manufacturers, like GE and Cree, offer bulbs with 10-year warranties, none of which cost more than $20. Consumers with a healthy dose of skepticism regarding LED longevity claims should look for bulbs like these, by manufacturers willing to put their money where their mouth is. Before LEDs exploded into the lighting scene, compact fluorescent lights (CFLs to you and me) were seen by many as the heir apparent to incandescent lighting. Despite the fact that CFLs use between one-fifth and one-third the energy of incandescents, and typically save one to five times their purchase price over the course of their lifetime, many people weren't thrilled at the idea of switching over. Some find the whitish light output of CFL bulbs less aesthetically pleasing than the warm, yellow tone of most incandescents. Others are quick to point out that CFL bulbs that regularly get powered on and off for short periods of time tend to see a significant decrease in life expectancy. There's also the common complaint that most CFLs aren't dimmable, and that they often take a second or 2 after being switched on to fully light up. The good news here is that CFL technology has improved a lot since EISA was signed into law in 2007. Today, you'll find a greater variety of color options, including bulbs rated at the low, yellow end of the Kelvin scale, and you'll have an easier time finding dimmable CFLs, too. There are even "instant-on" CFL bulbs designed to eliminate that annoying delay between flipping the switch and seeing the light. The bad news is that in spite of these improvements, CFLs remain somewhat flawed. They're still prone to decreased life expectancy when you use them in short increments, so ideally you'll want to save them for lighting that you're going to keep on for longer periods of time. Additionally, most CFLs aren't intended for outdoor use, and some will fail to turn on in colder temperatures -- although you can find cold-cathode CFL bulbs rated for temperatures as low as -10 degrees Fahrenheit. Like all fluorescents, CFLs contain trace amounts of mercury -- typically 3 to 5 milligrams (mg), although some contain less. This creates the potential for pollution when CFL bulbs are not disposed of properly. The amount of mercury vapor in a standard CFL bulb is about one-hundredth of what you'd find in an old-fashioned thermometer. Even in such a small amount, mercury merits a degree of caution, as direct exposure can cause damage to the brain, lungs, and kidneys. That said, if a CFL shatters on your kitchen floor, you don't need to panic or evacuate your home. Just be sure to open a window and let the room air out for 10 minutes, then carefully transfer the glass and dust into a sealable container (and don't use a vacuum cleaner -- you don't want to kick those chemicals up into the air). If you can take the broken bulb to a recycling center for proper disposal, great. When I tell you to picture a light bulb, chances are good that you're envisioning an incandescent. This is the classic bulb of Thomas Edison. As a matter of fact, they aren't. EISA doesn't actually ban anything, at least not directly. What EISA does do is raise efficiency standards - specifically, the minimum acceptable ratio of lumens (light) per watt (electricity). Incandescents aren't banned; they simply have to become more efficient. Also, keep in mind that appliance lights and other specialty classes of incandescents are exempt from the new standards, so they aren't going anywhere. The door is still wide open for manufacturers to develop non-traditional high-efficiency incandescent bulbs that manage to meet the new standards. Halogens are just incandescent bulbs with a bit of halogen gas trapped inside with the lighting filament. This gas helps "recycle" the burned-up tungsten gas back onto the filament, making for a slightly more efficient light. Unlike the mercury in CFLs, this gas isn't anything that could be classified as hazardous waste. Due to their relative similarity to classic incandescents -- both in light quality and in cost -- halogens can work as a good compromise bulb for consumers who need to replace their incandescents, but who also aren't ready to commit to CFLs or LEDs quite yet. You want to be sure that you'll enjoy living with whatever light bulb you purchase, especially if you're choosing a long-lasting bulb that you'll live with for years. Fortunately, the Federal Trade Commission now requires light bulb manufacturers to put a "Lighting Facts" label onto their products' packaging, not unlike the Nutrition Facts label that you'll find on packaged food. These Lighting Facts include everything from the estimated yearly cost of using the bulb to more obscure figures, like lumens and color temperature. If you want to shop smart, it will help to understand as much of that terminology as you can. If you're buying a bulb these days, you'll be left in the dark if you don't know what a lumen is. The actual definition gets a bit complicated, involving things like steradians and candela, but don't worry, because all that you really need to know is that lumens are units of brightness. The more lumens a bulb boasts, the brighter it will be. So, how does this information help you? Let me give you an example. If you look at CFL or LED bulbs, you'll see that most all of them are marketed as "replacements" for incandescent bulbs of specific wattages. You'll probably see the word "equivalent" used, too, as in "60-watt equivalent." This can be frustratingly misleading, with "equivalent" often meaning something closer to "equivalent...ish." Relying on these wattage equivalencies can lead you to buy a bulb that ends up being far too dim or too bright for your needs, and this is where understanding lumens really comes in handy. With lumens listed on each and every bulb, you'll always have a concrete comparison of how bright any two bulbs actually are. The bigger the number, the brighter the bulb -- easy enough, right? After lumens, the next concept you'll want to be sure to understand is color temperature. Measured on the Kelvin scale, color temperature isn't really a measure of heat. Instead, it's a measure of the color that a light source produces, ranging from yellow on the low end of the scale to bluish on the high end, with whitish light in the middle. An easy way to keep track of color temperature is to think of a flame: it starts out yellow and orange, but when it gets really hot, it turns blue. Generally speaking, incandescents sit at the bottom of the scale with their yellow light, while CFLs and LEDs have long been thought to tend toward the high, bluish end of the spectrum. This has been a steady complaint about new lighting alternatives, as many people prefer the warm, familiar, low color temperature of incandescents. Manufacturers are listening, though, and in this case they heard consumers loud and clear, with more and more low-color-temperature CFL and LED options hitting the shelves. Don't believe me? Take a look at those two paper lamps in the picture below, because they're both CFL bulbs -- from the same manufacturer, no less. These days, bulb shoppers will find so many color temperature options that some lighting companies have cleverly begun color-coding their packaging: blue for high-color-temperature bulbs, yellow for low-color-temperature ones, and white for bulbs that fall in between. With so many choices available, the notion that the phase-out of incandescents is taking warm, cozy lighting with it is a complete myth at this point. Unless you live in a disco, you probably want the colors in your home to look somewhat traditional. This is where the color rendering index, or CRI, comes in. The CRI is a score from 1 to 100 that rates a bulb's ability to accurately illuminate colors. You can think of the CRI as a light bulb's GPA for colors, as it actually averages multiple scores for multiple shades. Manufacturers aren't required to list the bulb's CRI number on the packaging, but many of them choose to do so anyway, so you'll want to know what it means. To understand CRI a little better, let's imagine a basketball game played outdoors on a sunny day between a team in red jerseys and a team in green jerseys. Daylight is the ideal for making colors look the way they should, so it gets a CRI of 100. Most people watching this game would have no problem telling the teams apart, because red would appear clearly red, and green would look green. Now let's imagine that same basketball game -- except now played inside that disco I mentioned. We're indoors, it's a little dim, and we're stuck with multicolored spotlights as the only light source. A purple one shines down on a very confused point guard as he takes a shot. Can you tell if he's on the green team or the red one? I wouldn't be surprised if you couldn't, because the CRI of lights like those is abysmal. Now here's the rub: the CRI is highly imperfect and not always useful (the reasons why are mind-numbing, but you can read more here if you're curious/masochistic). The important takeaway is that CRI scores are really only helpful if you're talking about bulbs that sit in the middle of the color temperature spectrum. You'll probably see references to "white" or "natural" light on bulbs like these. In these cases, the CRI score can be a great way to tell a good bulb from a great bulb. In general, anything over 80 is probably decent enough for your home, but we're starting to see CRI scores creeping up into the nineties on some very affordable bulbs. If accurate color rendering is important to you, hold out for lights like these. And if you're buying bulbs on the high (blue) or low (yellow) end of the spectrum, take any and all CRI claims with a grain of salt. How do I tell if a light bulb is efficient? In simple terms, a light bulb is just a device that converts electricity into light. The more light you get per watt of electricity, the more efficient the light. With incandescent bulbs, efficiency is easy to understand because a specific wattage of electricity will always heat a tungsten filament to a specific temperature, which in turn will yield a specific level of light. This means that, generally speaking, one incandescent will be more or less as efficient (or by today's standards, inefficient) as another. With LEDs and CFLs, the bulbs still convert electricity into light, but the methodology is totally different. Light output isn't fixed to the temperature of a filament, which means there's more wiggle room for differences in efficiency. Simply put, unlike incandescents, LED and CFL bulbs are decidedly not created equal. This is another place where understanding lumens comes in handy. A 10W LED can easily outshine a 12W competitor if it converts watts into lumens more efficiently. All the wattage tells you is how much power the bulb uses. The lumens tell you how much light the bulb puts out. The ratio between the two tells you how efficient the bulb is. The more lumens you're getting per watt, the better the bulb is at converting electricity into light. What other factors will I want to consider? So far, we've covered the light bulb basics (and then some), but if you really want to get picky about your home lighting, or if you just want to delve a little deeper into the subject, there's a lot more to take into consideration. As you're probably aware, light bulbs come in a fairly wide variety of shapes. Knowing the actual nomenclature might save you some time. Let's start with the base of the bulb, the part that screws in. In the US, the most common shape by far is E26, with the "E" standing for Edison and the "26" referring to the diameter of the base in millimeters. You might also see E27 bulbs from time to time, which is the European standard. Those should still fit into common American fixtures, but keep in mind that voltage ratings are different in the two regions, with American bulbs rated for 120 volts compared to 220-240 volts in Europe. For smaller sockets, like you might find with a candelabra, you'll want to look for an E12 base. As for the bulb itself, the typical shape that you're probably used to is an A19 bulb. Increase that number to A21 or A23, and you've got the same shape, but bigger. Bulbs made to resemble flames are F-shaped, which is easy enough to remember, as are globes, which go by the letter G. If it's a floodlight you want, you'll want to look for "BR" (bulging reflector) or "PAR" (parabolic aluminized reflector). Those bulbs are designed to throw all their light in one direction only, which makes them useful for spot lighting, overhead lighting, and the headlights in your car. Some lights have hardware built into the bulb itself that can block the downward projection of light (BR and PAR bulbs do it intentionally, reflecting that light back upward). If you aren't sure exactly what you'll need from your bulb in terms of light direction, the safe bet might be to go with a bulb that shines in all directions. The term that you'll want to look for is "omnidirectional." A majority of modern lighting options now include compatibility with in-wall dimmer switches, and that's a good thing for anyone who likes the light down low. If this sounds like you, then you'll want to double check that your bulb's packaging says the word "dimmable" before you make a purchase. That said, some bulbs will dim down better than others -- and your mileage may vary depending on what switch you're using too. Most basic switches dim the light by flashing the power on and off faster than the eye can detect. In many cases, this can cause electromagnetic interference in the bulbs, which can lead to flickering light or a faint buzz from within the bulb. The dimmable ranges of these four LED floodlights varied; see CNET for a detailed test. If you're truly focused on lights that dim well, then you may want to consider a smart LED kit. With dimming smarts built right into the bulb, there's no need for a dimmer switch. Instead, you'll use a smartphone app, or perhaps a physical remote accessory, and you shouldn't encounter any buzzing or flickering. It's out there, and it's more affordable than you might think. Whether you want an elaborate network of fully automated lights, or just a simple bulb that you can program over your phone via Bluetooth, you'll find a growing number of options available from a variety of different sources. Starter kits aren't quite as flashy as some of the other new automation options we're seeing, but it'll work well if you're looking to automate your lights. You could even upgrade your system with a few of Insteon's fully automatable LED Bulbs, while you're at it. We've also seen interesting, LED-friendly systems from startups like SmartThings , so you'll definitely want to do a little research and shop around before committing to anything too elaborate. Belkin WeMo Light Switch is a single device that'll let you automate a light using the free WeMo app, or the popular Web service IFTTT. The WeMo Insight Switch is even more flexible, letting you automate not just lights, but anything you plug into it. Additionally, you could look for smart bulbs with Bluetooth or Wi-Fi built right in, like Belkin's own WeMo LEDs, Philips Hue Lux LEDs, the Connected by TCP LED Lighting Kit, or standalone color changing bulbs like the Tabu Lumen LED and Lifx. Many of these don't even need any additional products or software. Just screw them in, download an app, and start automating. Best of all, the cost of these sorts of bulbs is coming down fast. GE's Link LED is the cheapest we've tested, selling for just $15 per bulb. Keep in mind, though, that many of these bulbs will need to draw a tiny bit of power while they're powered off in order to remember your automation settings, and this means that they'll be slightly less energy-efficient than normal bulbs. For green-minded consumers, this kind of bulb might not seem smart at all. If you're looking for a little more color in your life, then be sure and take a look at a product like the Philips Hue Starter Kit. Aside from being fully automatable via a mobile app and control hub, the Hue LED bulbs are capable of on-demand color changes. Just pull out your phone, select one of millions of possible shades, and the light will match it. Can't decide between warm, yellowy light or a cool blue tone? Why not both? Because Philips opened the lighting controls to third-party developers, we're starting to see new smartphone apps that will do some pretty crazy things, like changing the color of your lights in rhythm with whatever music you're playing. Hue lights are even compatible with IFTTT, with recipes already available that will change the color of your lights to match the weather, or to signal a touchdown from your favorite football team, or even to indicate when your stocks are doing well. Philips isn't your only option here, though. We've seen new competitors emerge over the last year, like Lifx and the Lumen LED from Tabu. Each has its own merits, and might deserve consideration before you make a splurge. For instance, Lifx has a much brighter light output than Philips Hue, while the Lumen LED costs less and does a better job accurately producing shades of green. Even if a color-coordinated level of smart functionality makes your eyes roll, it still illuminates one last important thing about buying lights: you should look for the lighting setup that you'll enjoy the most, because you'll be using it more often than any other appliance in your home. Even if smart lights aren't for you, there's no reason not to be smart about your lighting choices. Know your options, shop intelligently, and you'll love your lights for years to come.